With portable devices, there’s always a risk of losing or damaging your hardware when you’re out and about. As such, it makes sense to make regular backups of your iPhone, iPad, or iPod touch, but in the past, that process has been easier said than done. With iCloud Backup, however, you can back up your iOS device's data automatically, even when you’re not using it. So what exactly does iCloud Backup take care of? According to Apple, your device’s settings; app data; the Home screen and how your apps are organized; photos and videos in the Camera Roll; iMessage, SMS, and MMS messages; and ringtones will all be uploaded. iCloud Backup doesn’t backup music or videos you’ve ripped from optical discs. For music, you can use iTunes Match, which costs $25 per year. in iTunes 10.5, you can select whether to use iCloud Backup or the standard backup to your computer. While Apple offers two methods of backing up your iOS device—backing up via iCloud, or backing up to your computer—you can only use one at a time. If you want to use iCloud backups for your device, you'll have to forgo backing up via iTunes, though you can make a manual backup to your computer: Sync your device to iTunes (via tethered or Wi-Fi sync) and, under the Backup section of the Summary pane, choose Back Up To This Computer and click the Sync button. When the backup is finished, switch back to Back Up To iCloud and click Sync once more. iCloud Backups are automatic, but you can trigger a backup in the iCloud settings of your iOS device. 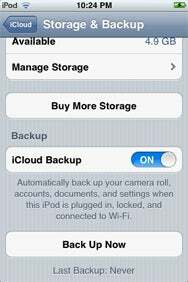 If you didn't elect to turn on iCloud backup when you upgraded to iOS 5 or set up your new iOS 5 device, you can enable it through the Settings app on your iOS device, or by connecting your device to iTunes and choosing Back Up To iCloud from the Summary pane. The initial iCloud Backup takes a few minutes, depending on how much data needs to be uploaded. For example, if you have several videos in your camera roll, the amount of time it takes to perform the first backup will be longer. Subsequent backups can take mere seconds to a few minutes, as, like Time Machine backups, iCloud will only back up what has changed on your device. iCloud Backup will automatically back up your device once a day, according to Apple’s website, and in our experience, it doesn’t back up every time you are in the presence of Wi-Fi and plug in your iOS device. However, when it is performing a backup, there's no indicator on your iOS device. There's also currently no way to schedule an iCloud Backup.